Last year we shamed Atos and occupied the Department for Work and Pensions in opposition to the injustice and distress caused by the Work Capability Assessment. 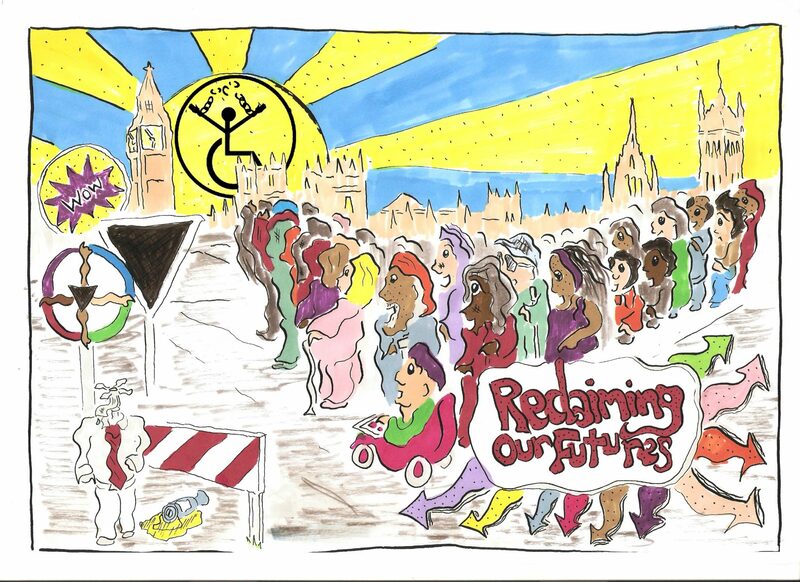 A year later and the only Paralympic legacy most disabled people have seen is one of more cuts and more anger. Research has shown that cuts are targeting disabled people. Meanwhile government and the media misrepresent figures and statistics to label disabled people as benefit scroungers. We say this isn’t right. We say we need to unite and fight against injustice. Join us for the final day of the Reclaiming Our Futures Disabled People’s week of action as we protest in Westminster. Four themed ‘blocks’ will meet at 4 Government departments, central to the lives of disabled people. After handing over our demands, blocks will then move towards Parliament where we will formally launch the UK Disabled People’s Manifesto and present our demands to our elected representatives. “5 – 6pm – launch of the UK Disabled People’s Manifesto”<— So were any carers involved? Or were they forgotten in the same manner every other arseholes treat them? This government coalition. ! Has been like a cull of the vulnerable sick aged disabled and mentally sick . Those who had not been unstable suffered depression hopelessness despair and some committed suicide ! 73-78 deaths a day which are linked to the benefit reform and ATOS assessments ! This government singled groups out as scroungers and benefit fraudsters ! Making it very hard to go out for many disabled in fear of backlash from public ! People have been labeled and treated like lesser humans ! People are starving and living in fear for the brown letter to see if ATOS wants to see them because you know they will stop benefit for no apparent reason just because they can . I’m waiting for my DLA. To go over to PIP. This is a major worry because if they say money stopped even though I’ve got indefinite DLA and mobility I cud be stuck I the house . I have bed tax pay and now council tax where b4 this was covered by benefit ! It’s so hard to carry on and winter fuel bills are so high how ppl will manage I don’t know kids go hungry . I admit with shame its driven me to the edge to feel like ending it all ! So back on meds . These are crimes against human beings our human rights have gone the government is a law to its self ! ATOS days are numbered if Liam Byrne’s speech recently is anything to go by. His blistering attack on IDS and DWP is talking the talk but what are his solutions? Well to start with a single one off WCA type assessment instead of regular call backs is some progress I guess, but he’s arguing the Labour Party were only testing it and the coalition didn’t finish the test. He’s threatening ATOS with the sack if they don’t perform “within weeks” of a Labour govt taking office (so appeals costs are reduced) but will they go lightly and let Labour bury it’s past, or demand rather more as recompense for an inhuman experiment no decent person would consider?